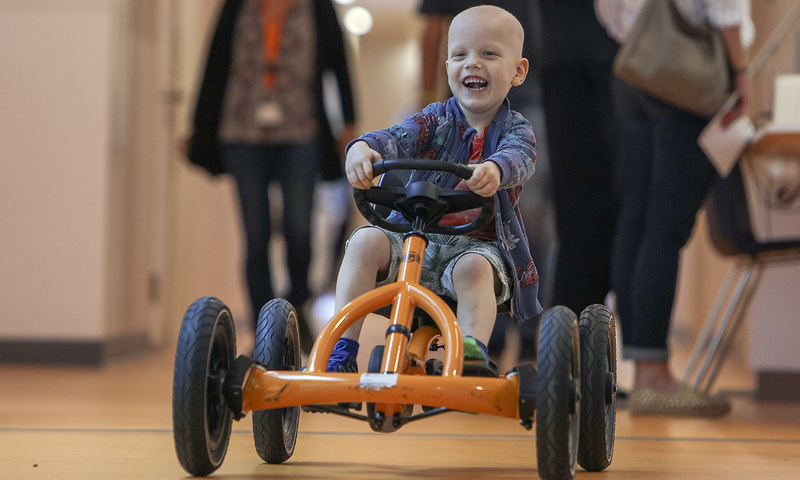 The Princess Máxima Center for pediatric oncology wants every child with cancer to recover, with optimum quality of life. We offer children with cancer the best care and treatment. An important starting point here is development-oriented care. We do everything we can to ensure that the normal life of your child and family continues as well as possible despite the disease and the required therapy. Because the treatment of childhood cancer is so intense and has a lot of impact on the child and his family, it is essential to continue to give shape to and support that development, despite the limitations that the disease and treatment entail. This requires Development-oriented care. We stimulate the physical, cognitive, emotional, social and spiritual functioning of your child in various ways. All professionals work together on the development of your child, from the support staff to the specialists. In everything we do, we ask ourselves: what does this mean for the child, for the parents, for the family? What does this mean for the quality of life now and later? We always put the interests of your child and family first. We consider it important to follow the development of your child and your family during and after treatment. To keep an eye on how your child and your family are doing, we ask you/your child questions via the KLIK portal. These questions are about the development of your child in various areas such as physical development, how your child feels and how things are going at school. In this way, we can, if necessary, provide support on time. More information about KLIK can be found here. In all care processes, we strive to focus on the development and quality of life of the child and family. In everything we do in healthcare, education and research and in what we build and decorate, we always ask ourselves what the meaning is for the child and the family. what does this mean for the quality of life now and later? Development and evaluation of (care-innovative) methods that contribute to the goal of development-oriented care by stimulating the development and promotion of the quality of life of children and parents. Making new employees aware of our vision on development-oriented care and transferring knowledge about the practice of development-oriented care and the relationship with medical traumatic stress. Development-oriented care is fully integrated throughout the organization. All our employees are constantly working together to stimulate the development of the child. An important part of the development-oriented care are the activities and events that reduce stress, provide distraction and entertainment and strengthen the interaction between children. The activities and events take place in the entire center including the specially designed ABO areas (areas intended for distraction, movement and meeting). Another important contribution to development-oriented care is the involvement of the child's family members in the activities and events. In the building specific extra areas have been created, the so-called Abo spaces (areas intended for distraction, movement and meeting) where children and parents can go and where stimulation of the development in different areas is central. In addition, there are more areas and activities that meet the needs of children from newborn to eighteen years old. the many play areas, meeting rooms and educational rooms stimulate the normal development of children. View all the play and learn areas.